"It is absolutely necessary to conclude that the blood in the animal body is impelled in a circle, and is in a state of ceaseless motion; that this is the act or function which the heart performs by means of its pulse." William Harvey's description of the circulation of the blood and the motive force of the heart in de Motu Cordis (1628) is considered the beginning of modern physiology. In the adult human body, the heart beats about 70 times per minute, or approximately 100,000 beats per day. During exercise or intense emotion the human heart rate can increase to 200 beats per minute. Thus, in a life span of seventy-five years, with everyday stresses and emotions, a human heart may beat more than 3 billion times. The heart pumps approximately 100 milliliters per beat. In seventy-five years, this amounts to 300 million liters of blood. The pumping action of the heart and the changes in its activity in response to body needs are necessary for life, so much so that up to one-third of all deaths in the United States result from heart disease. 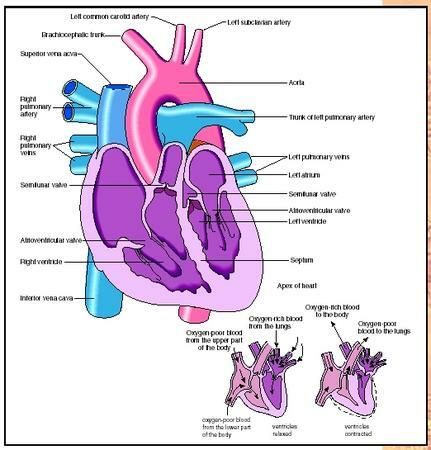 In humans and other mammals, the heart consists of two pumps. The right side of the heart pumps blood to the lungs, where the blood is oxygenated and then returns to the heart. This circuit is called the pulmonary circulation. The left side of the heart receives oxygenated blood from the lungs and pumps it to the rest of the body. Then, as was first described by Harvey in 1628, blood is pumped throughout the body and returns to the heart, to be pumped again to the lungs. The circuit of blood from the left side of the heart, to the periphery, and then back to the heart is known as the systemic circulation. Contraction of the heart underlies its pumping action. Most heart cells are muscle cells. Contraction of the muscle cells and coordination of their pumping action is controlled by electrical activity in the heart cells. Anatomy of the human heart. The heart is located in a lubricated sac (the pericardium) in the left center of the thorax (chest). Blood returning from the body enters the right side of the heart from the superior vena cava, which carries blood from the head and other parts of the body above the heart, and the inferior vena cava, which carries blood from parts of the body below the heart. These veins merge as they enter the upper chamber on the right side of the heart, the right atrium, which acts as a "receiving room" for blood entering the heart. Blood in the right atrium flows into the right ventricle , the lower chamber on the right side of the heart, through the tricuspid valve, a one-way valve. The tricuspid valve allows blood to flow into the right ventricle but prevents its return to the right atrium when the ventricle contracts. Instead, ventricular contraction pumps blood out through another one-way valve, the pulmonary valve, into the pulmonary artery, which carries blood to the lungs. All of the blood that is pumped to the lungs by the right side of the heart returns to the heart through four pulmonary veins that empty into the upper chamber on the left side of the heart, the left atrium. From the left atrium, blood flows into the lower chamber on the left side of the heart, the left ventricle, through another one-way valve, the mitral valve. Similar in function to the tricuspid valve on the right side, the mitral valve prevents blood from reentering the left atrium and pulmonary veins when the ventricle contracts. Contraction of the left ventricle pumps blood out of the heart through the one-way aortic valve, into the largest artery of the body, the aorta. As the aorta curves over the top of the heart, large arteries branch off to the head, arms, and upper thorax. The aorta descends through the lower part of the thorax and abdomen, where arteries branch off carrying blood to the liver, spleen, intestine, kidneys, gonads, and legs. After passing through smaller arteries and then capillaries, the blood returns to the heart through the veins. Also branching off the aorta as it leaves the heart is a pair of coronary arteries. These arteries supply blood to the heart and are considered part of the systemic circulation. After passing through capillaries in the heart, blood in the coronary circuit returns to the right side of the heart through veins that empty directly into the right atrium. Heart attacks are caused by clots in coronary arteries, depriving the heart muscle of oxygen. When the heart is relaxed, blood pressure in the veins is higher than the atria , which in turn are higher than the pressures in the ventricles. Hence, blood flows from the veins into the atria and from the atria into the ventricles. Contraction of the heart (systole) begins first with the atria. As atria contract on both sides of the heart, atrial pressures increase, pushing more blood into the ventricles; however, after a delay of about 0.1 second, the ventricles begin to contract. When the blood pressure in the ventricles becomes greater than in the atria, the tricuspid and mitral valves close. Contraction continues, increasing pressure in the ventricles still further until it exceeds the blood pressure in the exit artery (the pulmonary artery for the right side, the aorta for the left side), at which point the arterial valves open, and blood flows into the arteries. As contraction of ventricles continues, blood pressure in the pulmonary artery and aorta reaches a maximum, the systolic blood pressure. Blood pressure then falls slowly as blood flows away from the heart into the lungs and periphery, respectively. Diastole begins when the heart relaxes, and the blood pressure continues to fall. The lowest blood pressure reached in the arteries before the next contraction is the diastolic pressure. For a healthy young adult, an aortic systolic pressure of 120 millimeters of mercury (mm Hg) and a diastolic pressure of 70 mm Hg are normal. Since blood pressures in the aorta and the arteries in the arm are approximately the same, measurement of blood pressure using an arm cuff is a reasonably accurate method of estimating the aortic systolic and diastolic blood pressures. Pressures in the pulmonary circulation are lower than in the systemic circulation. Contraction of heart muscle cells is caused by the movement of ions into and out of the muscle cells. This movement of ions is an electric current that can be observed by placing electrodes on the skin. Measurement of the electrical activity of the heart is known as an electrocardiogram. The inside of relaxed muscle cells is negatively charged. When channels permeable to sodium open up, sodium rushes into heart muscle cells, making the inside more positive. This causes calcium channels to open, and calcium rushes in. Calcium causes contractile proteins (actin and myosin) to attach and pull on one another, producing force. Calcium is the most important ion for activating contraction. Potassium going out of the cell makes the muscle cell negative again and terminates the contraction. This cycle of electrical activity, going from negative to positive to negative again, is called an action potential. Action potentials in one muscle cell can excite adjacent muscle cells. This process spreads and coordinates contraction over the entire heart. Some muscle cells are adapted for conducting the electrical activity from one part of the heart to another. Other muscle cells initiate action potentials spontaneously and are known as pacemaker cells. Pacemaker cells in the sinoatrial node, located over the right atrium, initiate the cardiac cycle. Systole begins when excitation spreads over both atria, activating atrial contraction. Excitation spreads to the atrioventricular node, near the atrioventricular border, from which excitation is conducted by the bundle of His and the Purkinje system (groups of specialized muscle cells) to the bottom of the ventricles. Excitation spreads upward in the ventricles, contracting them from the bottom up, like squeezing a toothpaste tube from the bottom. When the action potentials end, diastole (relaxation) begins, until excitation is again initiated by the pacemaker cells of the sinoatrial node. Electrical activity of the heart is recorded in an electrocardiogram. Here, one complete cycle is shown, comprising contraction and relaxation of the atria and the ventricles. Five waves in the normal electrocardiogram correspond to the movement of ions into and out of muscle cells and the direction of conduction over the heart. 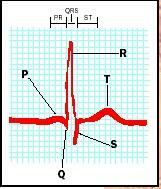 P is due to activation of atrial cells. Q, R, and S waves correspond to activation of ventricular muscle cells. (The positive or negative direction of QRS waves depends on whether activity is spreading towards the electrode or away from it.) The T wave corresponds to the end of the ventricular action potential. No wave for the end of the atrial action potential is seen because it occurs at the same time as QRS. Abnormalities in the size or duration of the electrocardiogram waves can be used to diagnose heart attacks and other forms of heart disease. In abnormal hearts, waves may be missing or out of sequence. Ganong, William F. Review of Medical Physiology, 19th ed. Stamford, CT: Appleton & Lange, 1999. Harvey, William. "On the Motion of the Heart and Blood in Animals, 1628," trans. Robert Willis. In The Harvard Classics, Vol. 38: Scientific Papers; Physiology, Medicine, Surgery, Geology, with Introduction, Notes and Illustrations. New York: P. F. Collier & Son, 1910. Obtained from <http://www.fordham.edu/halsall/mod/1628harvey-blood.html> . National Vital Statistics System, NCHS, CDC. "10 Leading Causes of Death, United States 1993–1995." <http://www.cdc.gov/ncipc/osp/leadcaus/ustable.htm> . Vander, Arthur, James Sherman, and Dorothy Luciano. Human Physiology: The Mechanisms of Body Function, 7th ed. Boston: McGraw-Hill, 1998.